Concerned About Artificial Additives in Dog Treats? Make Your Own! Have you ever stopped to think about what type of ingredients are in your dog treats? It's always important to educate yourself about what ingredients to look for when you check out your pooch's snacks. The first thing to keep in mind that dog treats should always be made in the U.S. Another tip to remember is if you're not sure what an ingredient is, look it up online. There are many ingredients that can be harmful to your pooch, so think twice before buying your dog any treat that looks or sounds good. 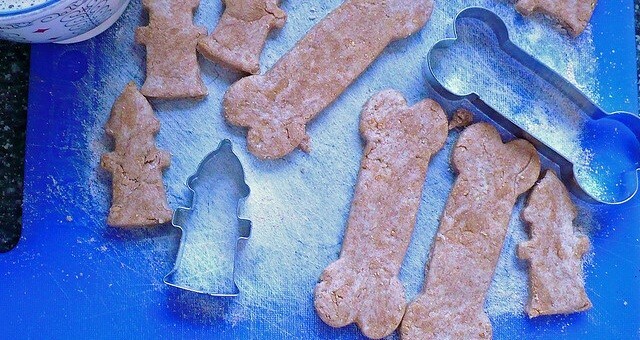 When time allows how about you make some dog treats instead?! Not only are they super tasty for your pooch, but they're healthy too. Want to know the best part about making your dog treats? You control what ingredients get put in them! So ditch the artificial additives that are found in many treats and start making your own. Your pup will love the gesture, and you'll feel better knowing you know what's going into your fur baby's treats! Learn how to make homemade doggy treats after the break. (VIDEO) This Pug Finds a Pacifier. Watch What Happens When His Pug Sibling Tries to Take it From Him! Watch a Toddler Get Into a Fight With a Bulldog — Too Funny! (VIDEO) This Frenchie is a Cry Baby. When You Find Out Why? Poor Puppy, LOL!